That feeling soft and broad? 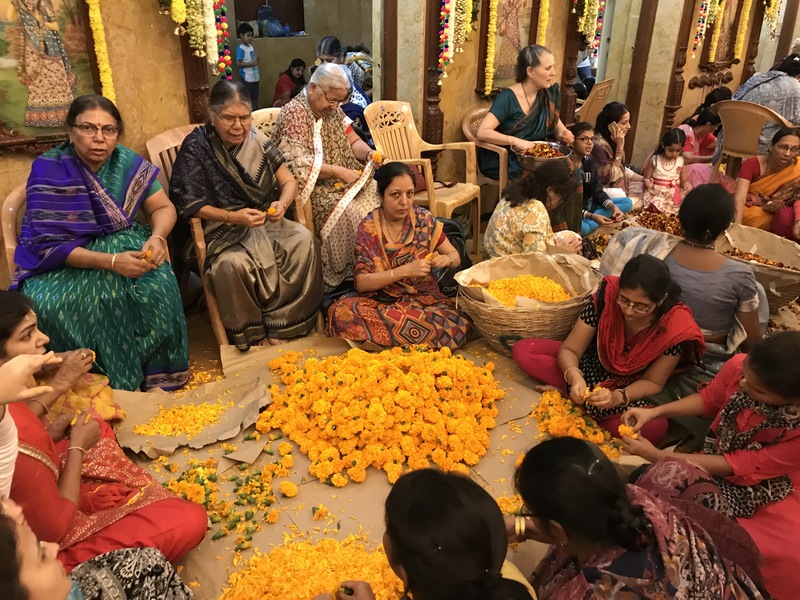 It’s really impossible to describe in words the Flower Festival that’s held each year on the last Saturday of January at the Radha Gopinath temple here in Mumbai. But I strongly suggest you mark your calendar and try to be here next year, if it’s at all possible for you. Each year the temple is decorated differently. This year the background theme was white. Floor to ceiling fringes of white tuber rose, with its intoxicating fragrance, draping like curtains of beauty on the walls and the ceiling on all sides. First comes the plucking. Many friends plucked generous donations of flowers from the stems of their bank accounts. 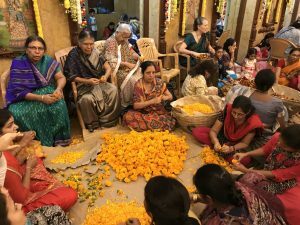 I don’t know how much one and a half tons of flower petals costs in Mumbai, but it must have been expensive. Deep gratitude to them! 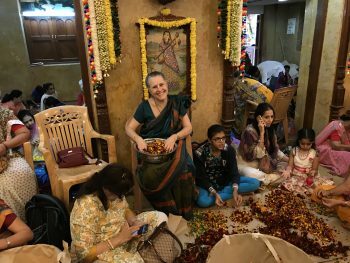 Cross-legged on the floor are sitting multi-billionaire industrialists next to simple street sweepers. 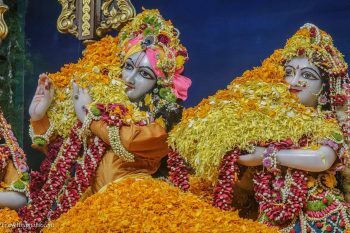 In Bhakti, all should be equal. 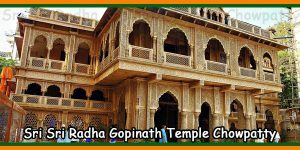 The monks who serve in this temple are required to complete their degrees and work at least a year in their field before they are eligible to live and serve here. They are engineers, professors, and MD’s and Phd’s of various stripes. 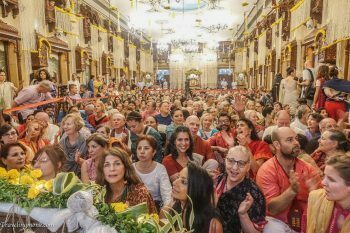 And they are all steeped in the wisdom books of the Bhakti tradition. 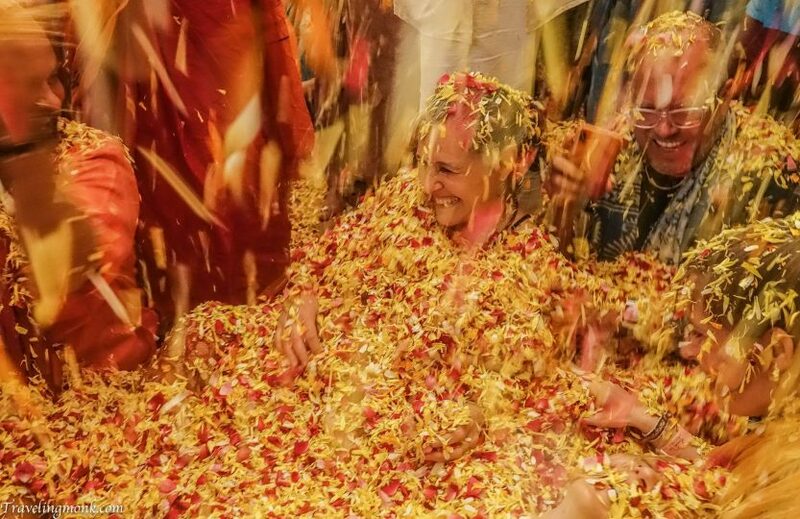 In the evening, the festival begins when these learned monks become like little boys throwing fistfuls of flower petals from above and behind onto the temple deities of Sri Sri Radha Gopinath, until the deities are completely covered- buried in red, then yellow, then pink, then white fragrant arrays of flower petals. 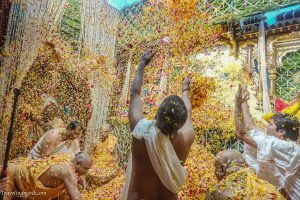 T hen the petals are again collected in baskets, now as sacred “prasad” having been offered to the Lord. 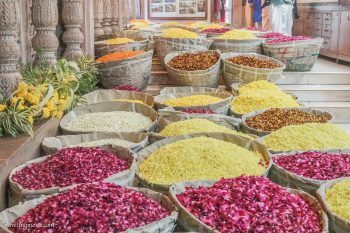 Then from all the balconies above on all sides of the temple room, these petals are showered on all who are present, as grace, as manna from heaven. Then all hell (heaven?) breaks out as a loving war of petal throwing overtakes us all. 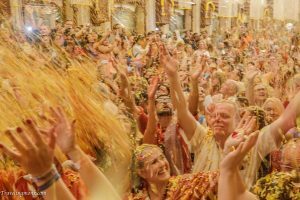 All barriers are broken, all misunderstandings forgotten as we ourselves become the petals being thrown and offered to each other in waves of mirth and the joy of devotion. How can my earthly words describe it? Click here for a short video clip of all the fun!